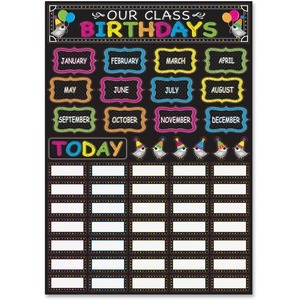 Mini bulletin board set offers a fun, imaginative way to present birthdays to your entire class. Write-on/wipe-off surface quickly wipes clean to make edits fast and simple. Built-in magnet sticks instantly to magnetic-receptive surfaces for versatile display options. Scribble chalk theme matches with other Ashley items (sold separately) for a coordinated classroom.